instructional and whole-school redesign plans and resources! A total revision and reorganization makes the 7th Edition Instructor's and Administrator's Guide for Career Choices the most complete resource ever available for Career Choices instructors and program administrators. This guide provides the roadmap and the resources to make meaningful, student-centered career and education plans a reality for ALL students. By implementing a comprehensive guidance course and school-wide initiative built on the proven methods of Career Choices and My10yearPlan.com®, you can increase your high school and college completion rates. 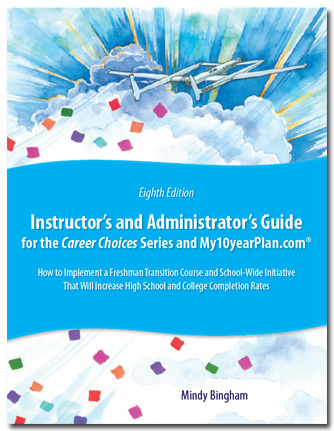 Each purchase of the Instructor’s and Administrator’s Guide for Career Choices and My10yearPlan.com® included with a school adoption comes with a two-year license to an online version of this manual. This convenient new resource provides easy access to the Instructor’s Guide wherever and whenever you need it as well as added information not included in the textbook edition. Topics that are expanded in the online Instructor’s Guide are noted in the print version with a small computer symbol. You can access the easy-to-navigate Instructor’s Guide on your computer, tablet, or phone, so lesson plans and buy-in talking points will always be right at your fingertips. Once you login to use the Instructor’s Guide, you can choose to view an entire section at a time or navigate right to the page you’re looking for with just a few clicks. Whether you are a technology pro or novice, you’ll find the online Instructor’s Guide to be a valuable, time-saving companion in your busy day.